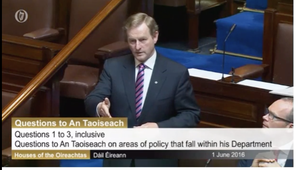 You may recall Taoiseach Enda Kenny’s comments about the 8th amendment last week. 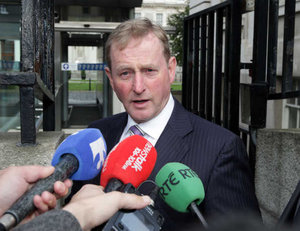 And the subsequent appeal for him to correct the Dáil record. 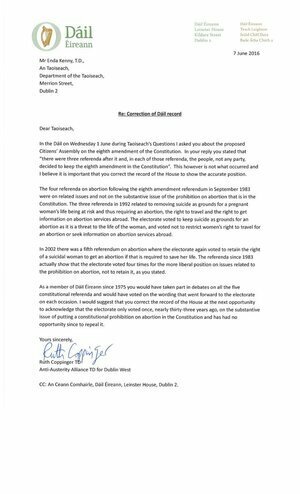 Earlier today, during Order of Business, the opportunity for him to correct the record arose when Social Democrat TD Catherine Murphy raised the matter. 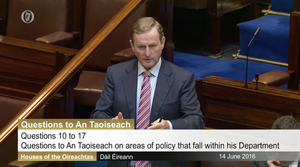 Posted in Misc and tagged 8th amendment, Dail record, Enda Kenny at 9:37 pm on June 8, 2016 by Broadsheet. If ever there was a transcript that summed up the current state of Irish politics…. It’s not sensitive. It needs to be sorted out now. We need free, legal and safe abortion on demand immediately. “Turf, is it?” is probably the greatest phrase I’ve ever heard. Jesus wept. And then some!!! wow. where to even begin. The above exchange kind of serves to illustrate why Enda Kenny has to take the softly-softly approach as regards to the 8th. While many people in Ireland are in favour of loosening Ireland’s archaic restrictions on abortion laws somewhat (at least in the case of fatal foetal abnormalities), a large proportion of the electorate is made up of the type of people who elect the Healy-Raes – who purports to believe that there isn’t any climate change because God made the weather, and won’t countenance any easing of the abortion laws. Michael Martin, who would probably go along with repealing the 8th for foetal abnormalities, etc, but would need to know that there was a groundswell of support for such a move (several front-bench FF TDs went against the party line on the marriage equality referendum; any move on abortion would be even more divisive. ).